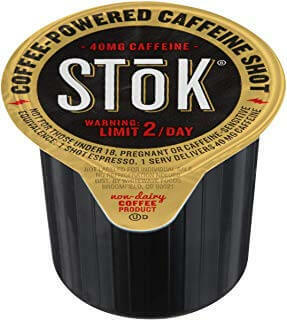 MORE COFFEE IN YOUR COFFEE: SToK Caffeinated Black Coffee Shots are the perfect solution to add a quick hit of energy to your day. Add a single-serve pod to your morning cup in your home brewed coffee for a caffeinated kick to get you through the morning. PATIENCE NOT HEAT: SToK’s coffee shots are made with the same cold brew process as our other coffee products which means you get 40mg of caffeine that’s not been scorched with hot water with the same delicious wake-you-up flavor of our cold-brew coffee. WE DREAM IN COFFEE: We’re curious. We’re tinkerers. We’re obsessive. We’re a little nerdy. We stand proudly with the maker generation celebrating craft and creativity & trading mindless consumption for authentic enjoyment. And we’re starting with coffee. BETTER IS ALWAYS OUT THERE: We’re not about exclusivity; we’re about great coffee. Bold, smooth and awesome in its pure delicious coffeeness. We’re here for anyone who loves great coffee as much as we do and is looking to take their coffee to the extreme. BEYOND COMPARE: See how the bold smooth flavor of SToK stacks up against Peets, McCafe, Folgers, Death Wish, Starbucks, Maxwell House, Kicking Horse Coffee, Hygge Coffee, Peets, Valhall, Java Caffe, Vita Camerons, Lavazza, Caribou Coffee or Café du Monde.